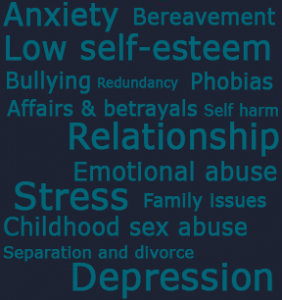 I am a BACP Accredited Counsellor trained in short-term therapy, working with issues including: stress/anxiety, bereavement, depression, low self-esteem or confidence, sexuality and work issues, as well as working longer term with people who are living with the effect of abuse in their lives. I also trained as a Relate counsellor, exploring relationship problems with couples and individuals. Are you looking for a warm, genuine and 'down to earth' counsellor with many years of experience, to help you make sense of life right now? I would describe myself as an authentic and warm personality, unfussy and without ego. So if I sound like that person, do give me a call and we can arrange a time to talk and begin working on it! My counselling training covered a number of different approaches, this in addition to 16 years' experience of clinical face-to-face counselling, means that I have worked with people from a range of backgrounds. From people confused and uncertain about their next step, through to those coping with great distress. This, together with my own broad life experience, helps me to understand, appreciate and empathise with my clients. I believe the relationship is key in successful therapeutic work. Consequently, my approach in counselling helps us to develop a genuine, honest and trusting relationship, and provides you with a safe space in which you can unload your difficulties. Taking the first step to making sense of your situation.